Transitional bathroom designs feature a blend of the old and the new, merging fixtures and décor ideas from multiple eras. The popularity of this look allows homeowners to keep up with current trends while hanging on to beautiful or sentimental items from the past. Infact, it’s often possible to create a transitional look in your bathroom by replacing just a few key elements. Adding a glass shower enclosure effectively brings contemporary flair to a space. 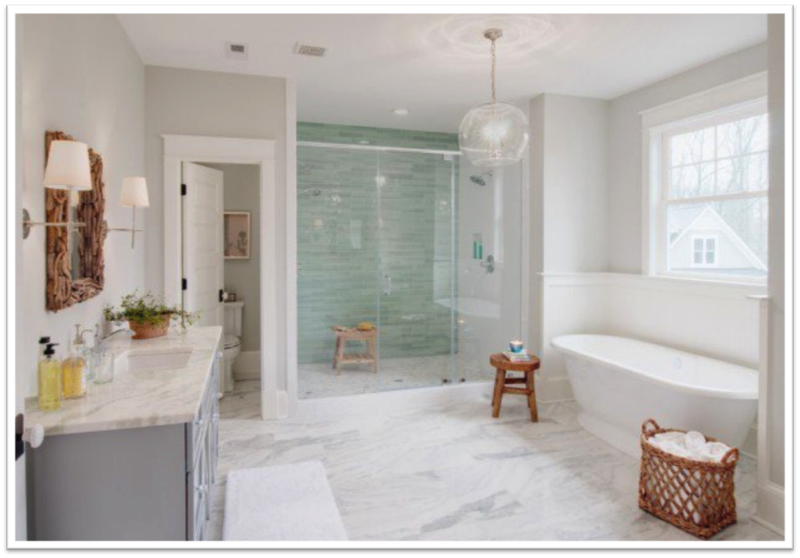 Characteristics like clear glass and minimal hardware yield a shower stall that feels fresh and open while instantly updating the room’s overall style. Even within this one fixture, it is possible to create a transitional look by pairing a sleek modern enclosure with an ornate gold-plated handle or rustic shower bench. The vanity mirror is another bathroom component that can play a key role in achieving a transitional feel. If you need a mirror with a more futuristic look consider something simple but dramatic like a polished edge wall mirror that reaches up to the ceiling or perhaps mirror glass with a bold geometric shape such as circle, hexagon, or square. On the other hand, some homeowners may wish to give a modernistic bathroom greater warmth and coziness by bringing in some classic items. A tastefully framed mirror could add instant personality to a sterile vanity area that is defined by an industrial metal sink. • Antique handles and hinges. Conversely, here are some more décor choices that exude modern elegance. • Back-painted glass wall covering. 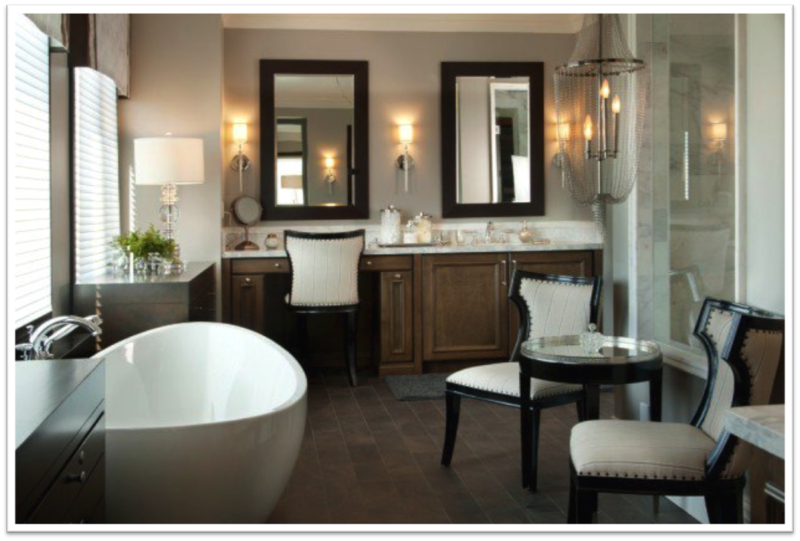 Don’t overlook the other aspects of bathroom design as you seek ideas for your transitional space. Selecting a popular paint color allows you to bring today’s trends into any space, as does the choice of modern wall-hangings and accessories such as the soap dispenser and toothbrush holder. Window treatments, towels, and rugs present still more options for either bringing in the latest fad or introducing classic textures and patterns that have stood the test of time.